Britons are being advised against all travel to Bahrain after a fresh wave of anti-government protests swept the island kingdom over the weekend, triggering clashes between police and demonstrators. The Foreign and Commonwealth Office (FCO) warned that all UK nationals currently in Bahrain should remain at home until further notice. The warning by the FCO comes amid reports that Saudi National Guard soldiers are about to enter the Gulf state, and holidaymakers who had planned a visit to the country could risk invalidating their travel insurance policy if they ignore the Foreign Office advice. 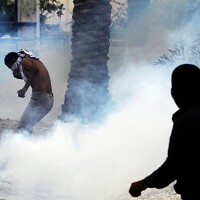 The FCO said in a statement: "Following an increase in protests over recent days, confrontations between protesters and police, reports of protesters establishing roadblocks, and reports that the Saudi National Guard will enter Bahrain, we advise British nationals currently in Bahrain to remain at home until further notice. "The risk of further outbreaks of violence has increased. If British nationals do travel within Bahrain they should maintain a high level of security awareness, particularly in public places and on major highways, and avoid large crowds and demonstrations." Government officials had previously advised against all but essential travel, but amended their advice following clashes in the capital, Manama, on Sunday. The island country has seen a month of unrest with anti-government demonstrators demanding the reform of the monarchy.